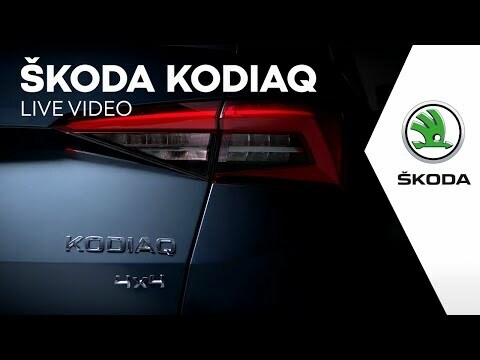 The ŠKODA Kodiaq coming soon to Des Winks Škoda. Contact us now for more information on the launch of this amazing new Škoda. In combination with the narrow, raked headlights, which are available with full-LED technology for the first time, our first large SUV will be instantly recognisable on the road. The side and rear views are also sharp: the doors are athletically shaped and the tailgate is expressively sculptured. The rear lights, with LED technology as standard, shine in the typical ŠKODA C-shape. The ŠKODA KODIAQ will celebrate its world premiere on 1 September 2016, in Berlin. Watch Live below.. The ŠKODA Kodiaq was unveiled on 1 September 2016 in Berlin. The new seven-seater SUV has been described as a ‘game changer’ by ŠKODA Chief Executive Officer Bernhard Maier and represents a change of focus as the brand invites customers to ‘discover new ground’. The SUV is the first seven-seater vehicle in the ŠKODA range features full LED headlights and 720 litres of luggage capacity, (rising to 2,065 litres when the rear seats are folded away). It’s also equipped with an area view camera system, designed to give the driver a panoramic view of the area around the car. The Kodiaq will be unveiled at the Paris Motorshow in October, and is due to arrive at Des Winks early 2017. Our new ŠKODA Kodiaq will be based on the VisionS concept car which was revealed at the Geneva Motor Show earlier this year. The exterior design of the ŠKODA VisionS reflects the brand’s new emotional appeal. All the edges and lines are clear, precise and sharp, while crystalline design elements accentuate the exterior. The interplay of light and shadow creates powerful effects on the strikingly chiselled surfaces. At the front the bonnet relies on the creative use of plastics, with contours flowing towards the brand logo. The wide grille and four tapered, high-set LED headlights characterise the face of the show car, emphasising the vehicle’s SUV character. Crystalline elements in the vertical struts in the grille and on the logo are ŠKODA’s tribute to the Czech art of crystal-glass design. The side view also illustrates the strong SUV character of ŠKODA’s VisionS with sharp tornado line spanning the entire length of the powerful car body. Angular wheel arches emphasise the off-road character and the upper-shoulder contour forms a deep groove over the sills. The quickly sloping roofline with the long spoiler and tapered rear visually accelerate the show car even when stationary. The rear of ŠKODA’s VisionS has been sculpturally designed with a strong diffuser insert bordering the large exhaust pipes, giving the large SUV a visually powerful stance. The ŠKODA logo and shallow rear lights with dynamically cut crystalline housings sit just beneath the low rear window, while ŠKODA’s characteristic C-arm, beginning at the rear lights, runs into the flat reflectors in the bumper.